There are 11 posts filed in Notebooks (this is page 1 of 2). I recently acquired three small softcover A6 notebooks made by Leuchtturm, a Swedish company that I’ve seen more about recently, and already own a few notebooks from. These are called “Jottbooks” – they’re around the same size as, and fit a similar niche to, the pocket Moleskine cahiers, Field Notes, and the Clairefontaine “Life Unplugged” notebooks. So I will write about them. Like the Moleskines, they are stitched rather than stapled, which makes them easier to open flat(-tish) at any page, rather than just at the middle. (They won’t lie flat, but when you are using them, they don’t try to spring back into shape.) The covers are rather nice – shiny, textured, plasticky, like some sort of leatherette, tough but thin – they come in a good selection of bright colours as well. The feel of the covers as well as the colour selection makes the design feel quite 60s, in a good way, and definitely more durable than the card covers of Moleskines and Field Notes. There are 60 pages in each book, leaving it quite thin but larger than a Field Notes. The last 32 of those are perforated at the sides for you to rip them out. I’ve never really felt the need to tear out more than a few pages in a notebook, and 32 perforated pages is way too many, in my opinion. It doesn’t have a back pocket. 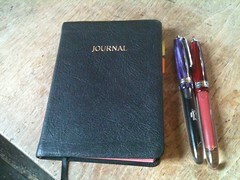 Back pockets are a silly Moleskine feature, particularly in thin notebooks like this. You don’t need a back pocket. With each Jottbook comes a pair of stickers, one with two lines on it and one blank. Presumably these are to apply to the outside or the inside of the cover and write a title or subject on. 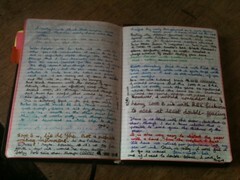 The paper in Leuchtturm notebooks generally is good, and pretty much the same across the whole range. I don’t think the quality is quite as good as the Clairefontaines, but it is proper paper that you can use big fat wet pens with. (See the last image in the gallery above.) On occasion there is some very slight feathering, but no paper is perfect. It’s 100gsm apparently but isn’t thick. 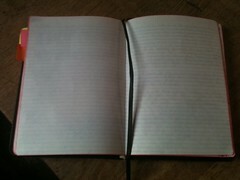 It’s slightly yellowy/cream off-white – lighter than Moleskine, not as white as Field Notes or Clairefontaine. Each page of the book after the name and index pages has a space for the date at the top and a page number at the bottom. This is slightly redundant for me as, reflexively now, I date every page I write anywhere and timestamp each entry, as well as numbering the pages in any sort of journal or book – I check my watch, write the time down, underline it and then continue with the note. I’ve trained myself to do this and it is incredibly useful and you should do it too – when looking back through notes it’s pretty vital to be able to see what order they came in and when you wrote them. I write the date on the inner side of the top of the page, closest to the centre – the date that I started the page on the left hand one, and the date that I finished the page on the right hand one, so that I can immediately see which dates the two pages span. The former dating structure can be continued with the pre-printed date area, but I can’t journal using the printed page numbers, unless I record an “offset” for them at the start. On the other hand, I’m not going to be using these as main journals anyway, more special purpose notebooks or casual jotting things, and for those purposes pre-printed numbers are a bonus. In general, +1 for encouraging people to think about the archiving of notebooks and not just assume they are going to throw them away. The Jottbooks I have are lined and squared. Leuchtturm do make notebooks with plain and dotted paper as well, but I’m not sure that they put it into the Jottbooks, or if they do you can’t buy them in the UK yet. Why would one want a Jottbook? You may or may not feel the need for pocket notebooks like these – I’m not sure that I do, my normal pocket “random thoughts” notebook is a Rhodia pad at the moment and I tend only to use little notebooks for special purposes like dream diaries or work on a specific project) – but I know that a lot of people do, and the Jottbook stands out in a number of areas. The cover is great – tough, waterproof, thin, colourful, feels nice. The book is stitched so durable and opens well at any point – small stapled books irritate me on this point (hello, Field Notes). The paper is good quality and won’t feather and bleed, but it’s not so thick that you only get a dozen pages in the book. There are 60 pages too which is a fair number. The pre-printed numbers save you having to do that yourself, and the structure keeps reminding you to date and index the book. They’re not particularly expensive. I paid £2.99 for each one, and used a 3 for 2 offer. Unless you write vast quantities or use a triple-broad nib that isn’t going to add up to a huge amount of money per unit time. The Official Chasing Daisies Thin Pocket Notebook Recommendation at the moment is thus either one of the Jottbooks, or a Clairefontaine “Life Unplugged” Duo. The latter have slightly nicer paper but are smaller, are staple-bound and don’t have quite such great covers. Swings and roundabouts really. Near the back of the shop they do have some practical but still attractive stationery, which will also take fountain pen ink. Here is an example that I picked up today. This is called a “Creative Book”. It is a fat sub-A4 squarish ring-bound notebook with a generous 140 pages of plain paper. This is nice paper – it didn’t bleed or feather when exposed to my most ridiculous fountain pen, a Lamy 2000 with a broad nib. (Edit: after some use, I can say that the paper is relatively absorbent, and spreads quite a bit, so even quite fine-nibbed fountain pens will be wider than normal.) The size is convenient for me as well. I find that ring-bound A4 notebooks tend to get a bit squashed when stuffed in a bag, and be a little too tall, but this fits well into my bag with the rings upwards. Why would I want such a book? I have pocket notebooks coming out of my ears, but sometimes when coming up with ideas it just isn’t ideal to have to scrawl on a little Rhodia pad or Habana notebook where you flip pages every minute and can’t see what you’ve already written without flipping back. Maybe you want to draw a diagram, or sketch a picture or wireframe, or make a mindmap. I used to have an A4 squared book which was good for this, but the size did result in ring-squashage, and the exact model that I had is now apparently not on sale any more. I don’t actually use it while travelling. Not that I travel much anyway but I can’t see that it would be all that preferable when doing so – it is durable yes, but the flexible cover would make it awkward to write in when there isn’t a convenient flat surface, which is more common when travelling. The plain paper refills are my favourite. The extra-thin paper does take ink very well, but I had two problems with it. Firstly, ink looks a little odd on it; it seems to dry with a little edge around the letters rather than shading as it does with normal paper. Secondly and more importantly ink is much more prone to smearing, even after days of drying. This may be unavoidable if it isn’t going to bleed, but I found it annoying enough to stop using the refill after ten pages or so. On the subject of annoyances, if anything is likely to make me stop using the thing, the way that the pages don’t lie flat is likely to be it. Particularly as you approach or leave the middle of the book and the cord starts to force the edges of one side up even more. Having a secondary refill in there doesn’t help either. This is a basic issue with the design and I doubt there’s any getting around it – I will just have to decide whether it is annoying enough to overcome all of the plus points.